Install the Panamax MIW Power-Pro PFP behind your wall-mounted flat-panel TV to protect your set against power surges and unsafe overvoltage conditions. Its two recessed outlets not only safeguard your TV and another device, but they also include built-in noise filtration to improve your gear's performance. And a voltage monitoring circuit disconnects power if the voltage reaches an unsafe level, then automatically reconnects power when safe voltage returns. This is also a great solution for a ceiling-mounted projector. Overview: The MIW-Power-Pro-PFP provides safe and noise-free filtered AC power to a remotely installed flat panel TV or ceiling-mounted projector. The outlet faceplate hides discreetly behind the installed component for a neat, professional installation, without the bulky power strips or hanging power wires. 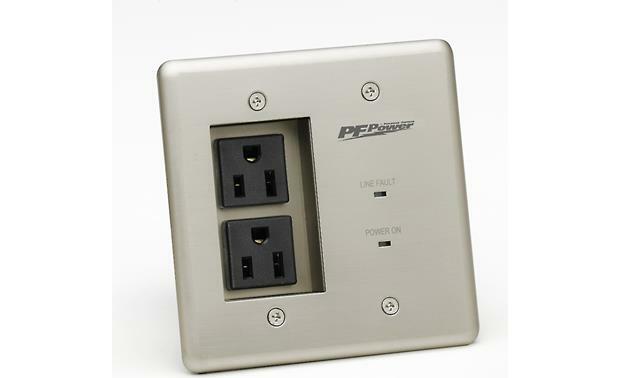 The MIW-Power-Pro-PFP faceplate requires a 4" wide by 3-3/4" high hole in the wall for the outlet box (not included). Installation Precaution: It is required that there must be at least 30 feet of wire between the electrical outlet and the electrical service panel. This is because of the UL 3rd Edition Standard for a Type 3 device. Power Outlets: The MIW-Power-Pro-PFP has two recessed standard 3-pronged AC receptacles. The opening for the outlets is 1-9/16" wide by 2-5/8" high by 1/2" deep, and can accommodate most straight 3-pronged power plugs. Right-angled power cords may not fit properly, or may prevent more than one component to be plugged in at a time. Voltage Monitoring Circuit: The built-in Voltage Monitoring Circuit protects equipment against prolonged over-voltages or under-voltages by disconnecting the power, then reconnecting it when safe power returns. The over-voltage shutoff point is 142 VAC (+/- 5 VAC), while the under-voltage shutoff is 84 VAC (+/- 6 VAC). 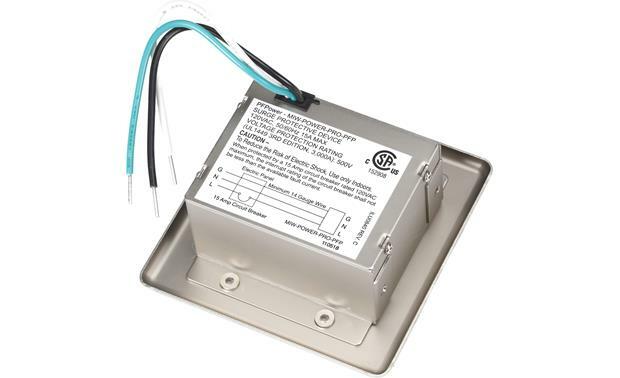 A Line Fault LED on the faceplate will glow as long as the unsafe voltage condition exists. Power On Indicator: A blue LED on the faceplate will glow to indicate power is being supplied to the outlets of the MIW-Power-Pro-PFP. Surge Protection: The MIW-Power-Pro-PFP provides a catastrophic surge circuit and thermal fusing to protect your connected equipment from power surges and spikes.